Novation's Impulse series are a range of professional USB/MIDI controllers. The Impulse 25 has a 25-key precision keyboard and full control surface powered by a brand new version of Novation's Automap control software - Automap 4 (which makes getting hands-on with your DAW/plug-ins fast and simple). Impulse also has 8 back-lit drum pads which can warp arpeggios, roll beats and launch clips in Ableton live. Impulse has a precision 'players' keyboard. It is semi-weighted with assignable aftertouch and has been designed to feel like an instrument rather than a computer peripheral. In addition to feeling good, it is incredibly accurate - this means it can translate musical expression (how you play the keyboard) extremely effectively. So your performance is reflected exactly by the synth or software instrument you are triggering. The control surface allows you to get hands on control for your DAW and plug-ins. We have worked with all the major DAW and plug-in manufacturers to make sure that you get instant control of your mixer, transport controls and plug-in instruments and effects. Many MIDI controllers have knobs, faders and buttons, but using them is difficult and time consuming. 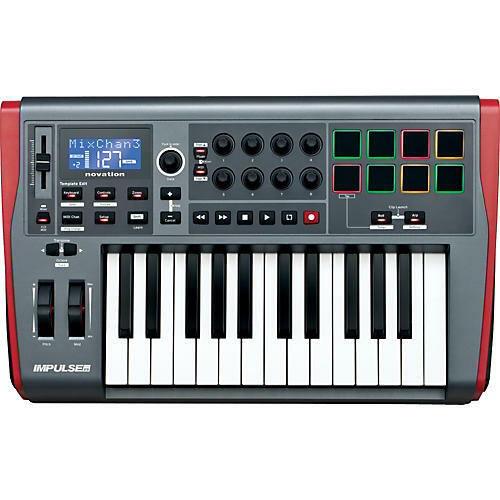 Impulse (as with all Novation controllers) comes with Automap control software. This gives you instant mapping to the things you need to control, meaning you can make full use of faders, knobs and buttons on Impulse to get hands-on with your music software. Automap is a piece of software that comes with all Novation controllers. It makes it fast and simple to control your music software with knobs, buttons and faders. It has been used by many top musician/producers since 2006. Impulse gives you control over the mixer, transport and plug-ins of all major DAWs, as well as plug-in instruments and effects that don't come with your DAW, like Native Instruments, Waves or FXpansion. Automap enables you to see instantly which knobs, faders and buttons are controlling which part of your software. It also makes it easy to quickly change what the knobs are controlling. Automap has a software edit page that looks just like the Impulse control surface. This labels what each knob, fader and button is controlling, because with so many things in your DAW and plug-ins, it is easy to lose track of what is assigned to what. You can hide this window once you are finished with it, so you can continue making music. Impulse's controls can be used to control your plug-in instruments and effects. When you open a software instrument/effect, the 8 knobs will already be linked to things in it. If you want to control different things, just press the ˜Learn' button, click on the software thing, and wiggle the knob that you want to control it. This way you can get hands on control of exactly what you want almost instantly. Impulse comes with Ableton Live Lite included - but if you are already an Ableton user, you will appreciate the power of this. The 8 drum pads can be used to launch clips in Live. The three colours indicate whether a clip is loaded (yellow), playing (green), or recording (red). This makes Impulse the best keyboard for Ableton Live users without exception. Impulse has a built in Arpeggiator which enables you to play a turn any chord into an arpeggio. The drum pads take this a step further by enabling you to warp arpeggios. By switching the 8 pads in or out you can change the rhythm of the arpeggio in real time (this works brilliantly with drums!) You can also change the speed, shape, syncopation and gate time of the arpeggio. All Novation Keyed controllers and Launchpad Pro now come with a choice from 1 of 4 XLN Audio Addictive Keys VST. Available for new and existing customers, the Addictive Keys virtual instrument from XLN Audio is on the house when you register your controller keyboard. One full license per account gives you one Addictive Keys instrument. Pick from Modern Upright, Studio Grand, Electric Grand or Mark One. Drum pads are great for playing drums! With Beat Roll you can hold on to the pad and create a roll - because the pads are pressure sensitive you can change the volume of the drum as it is rolling, just by pushing down on the pad. This enables some really cool performance tricks! In addition to the major DAWs, Impulse & Automap 4 have been specially designed to give you full control of 3rd party plug-in instruments and effects, like Native Instruments, Waves or FXpansion. Impulse will also work with other DAWs such as Studio One, Garage Band and FL Studio. Learn with Melodics: Free keys and pad drumming lessons with Melodics makes you get the most out of your controller straight out of the box. Time to act on Impulse. Order today!